When Merry and Pippin meet Treebeard we have the meeting of two races that have largely dropped out of knowledge of Middle Earth. The contrasts between hobbit and ent are pronounced, but both are races with many names and that love green things. Hobbits can be considered hasty by more than just ents, but I'd argue that they have a similar love of words, language, and speech, just expressed differently. I love that ent names are stories, the idea that "Real names tell you the story of the things they belong to." I've long wondered if Old Man Willow is one of the changed ents that Treebeard mentions. There's nothing to confirm one way or the other - perhaps Old Man Willow is one of the trees that was half-woken and has a 'bad' heart. Treebeard does confirm that there are such trees in the Old Forest to the north when Merry inquires. It's important to remember that ents largely exist outside the morality of the rest of the world. Sauron upset Treebeard not because he is evil, but because he interfered with the Greenwood. Similar to Tom Bombadil, but with more of nature's fury and destruction when they wish to bring it to bear. The ents are moving, but they move with roused purpose rather than impassioned anger. While the book heavily foreshadows the ents, Jackson gives us very little lead in. Shortly before things go all to hell with the orcs, Merry & Pippin briefly discuss stories of tree-herders and the possibility of the forest itself resenting the orcish intrusion. Our actual introduction is both a bit earlier and a bit more violent than the book, with Treebeard saving the hobbits from a hungry and quite resentful orc by simply stomping it flat. While brief conversation occurs, Treebeard treats the two hobbits as some type of 'orcish mischief' and casually inflicting accidental pain to Merry and Pippin. Merry recognizes the concept of a treeherder almost right off the bat, and is joyously fascinated (or as much as he can be while being uncomfortably squeezed). The bit about "Maybe you are, maybe you aren't, the White Wizard will know" is a nice touch. The audience at this point knows that Saruman has set himself up as a power to be contended with, and as one at least in league with (if not planning to overthrow) Sauron, but we've been shown it through his direct actions. The fellowship knows that Saruman stands as a threat to Middle Earth, but as the audience we know a lot more about his efforts. Personally, I wish that Jackson had made slightly different decisions in the insertion of different plot lines. For one thing, Frodo and Sam's pieces are taking place over a slightly longer timeline than everyone else's. For another it draws out a few parts long than I'd like, and some of the pieces would honestly make more sense otherwise placed. Having their initial attempt on the gates of Mordor before even the start of the Entmoot seems bizarre, especially when it could be used to further emphasize the extended nature of ent deliberation. Some of the plot related to Aragorn & Co also runs afoul, but in a (to me) less egregious fashion. Or, at least I think it does, I haven't reread that far ahead yet. I may be proven wrong. 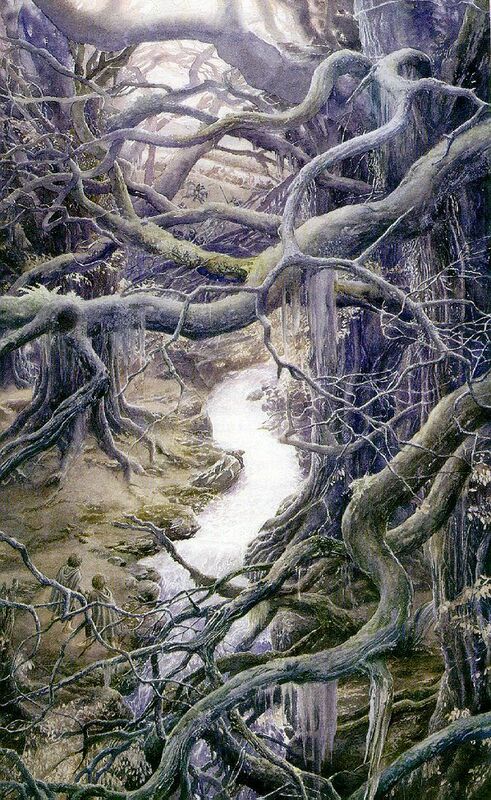 However, Merry & Pippin meet Treebeard in Scene 11, we get a little more Scene 14 (Fanghorn Forest). The Entmoot begins in Scene 35. Things in Rohan do occur with alacrity, but Merry and Pippin are acting at least a day ahead of everyone else, with I believe the Entmoot starting on the same day that Aragorn and Gandalf confront Theodin. The timing/spacing of the translation to film seem a bit off to me with all of that.